Seventy years ago, the fate of the world lay in Stalingrad. Today the battle there is commemorated in various monuments around the city now known as Volgograd. Seventy years ago, the fate of the world lay in Stalingrad. Today the battle there is commemorated in various monuments around the city now known as Volgograd. Photos by William Brumfield. Seventy years ago, on January 10, 1943, one of the most important battles in world history, the struggle for Stalingrad, entered its final agonizing days. On that day General (later Marshal) Konstantin Rokossovsky launched Operation Ring, which would ultimately lead to the annihilation of the remains of the German Sixth Army, encircled in the city. Innumerable books, films and other publications have described and analyzed the Battle of Stalingrad, including two masterpieces: Vassily Grossman’s “Life and Fate” and Viktor Nekrasov’s “In the Trenches of Stalingrad.” To this day the epic character of the battle has lost none of its power to grip the human imagination. Historians generally place the beginning of the Stalingrad campaign in July 1942, as the German Sixth Army, commanded by General Friedrich Paulus and aided by Italian and Rumanian allies, plunged into the south of Russia. Indeed, the advance seemed so overwhelming, that Hitler and his generals embarked on a strategic overreach that would have disastrous consequences. In a more narrow sense, the beginning of the battle can be dated to the concentrated Luftwaffe bombing of the city on Aug. 23. Despite the enormous destruction, there were yet again unintended consequences. The rubble-filled, destroyed city center allowed the Red Army to engage in deadly, effective close-quarter combat. Under these circumstances, the German tactical advantage in open warfare was negated, as was their initially overwhelming air superiority. Tanks had little room to maneuver and planes could not bomb without the risk of hitting German lines. On July 27 Stalin issued the famous order “Not a step back,” and thus began a battle of attrition that showed the best qualities of Soviet tenacity and supply organization. Holding on to the slimmest of territories, Soviet forces—including the legendary 62nd Army commanded by General Vassily Chuikov, tied Germans forces down until the great Soviet counterstroke, known as “Operation Uranus,” was launched under the supervision of General (later Marshal) Georgy Zhukov on Nov. 19. A massive pincer operation was successfully concluded on Nov. 23, 1942, when Red Army units from north and south linked at the town of Kalach, far behind the main German forces. An air relief effort was successfully repulsed, and the Sixth Army slowly starved as promised air supplies dwindled to a trickle. On Jan. 10, “Operation Ring” commenced. Soviet commanders had underestimated the size of the German force they had trapped, and over three more weeks of fighting ensued before the surrender of Fieldmarshal Paulus and his forces on Feb. 2. Indeed, isolated pockets of disorganized resistance continued until the beginning of March. The Soviet triumph was complete, but at enormous cost. There were perhaps as many as 800,000 Axis losses and a similar number of Soviet troops and civilians. Although millions more were to die before the final capitulation of Nazi Germany in May 1945, after Stalingrad, German armies never regained the strategic initiative in the East. The titanic scale of the struggle and its potent symbolism ultimately led to a memorial whose dimensions are appropriately vast. Individual statues and other monuments are spread along the Volga River and its tree-lined Embankment of the 62nd Army. At certain points tank turrets on pedestals mark the line of defense just a short distance to the Volga River. In addition, there are more substantial memorials, including the remains of buildings that became defining points in the conflict. One such structure is a memorial known as “Pavlov’s House,” which before the war was a four-story apartment house in an elite area near the Volga embankment. The building was subsequently named in honor of Sergeant Yakov Pavlov who, with two comrades, set up a defensive post near German lines on Sept. 23. Reinforced the next day, the house withstood all German attacks until Nov. 25, when the area was retaken by Soviet forces. The severely damaged house was rebuilt, and in 1985 the side facing the Volga became the site of a memorial wall commemorating the defense. Nearby is a plaza containing the distinctive, round Stalingrad Battle Museum, which includes a display of vintage military equipment. Its second floor features a large panorama depicting a phase of the battle. The most impressive feature of the square, however, is the massive ruin of a flour mill built in 1903 by the Volga German Alexadner Gerhardt. Gerhardt died at the hands of the Soviet secret police in 1933, but in an overwhelming irony, the building that he so solidly constructed to withstand the vibrations of heavy milling machinery became a central point in the Soviet defense against the Nazis. Even in ruined form, it was strong enough to stand as a vivid reminder of the battle’s destructive power. But the center of the city’s memorial ensemble—its high point in the most literal sense—is called Mamayev Kurgan, a small hill resembling a burial mound (kurgan) and popularly associated (despite no historical evidence) with a 14th-century Tatar ruler, Mamai. Because of its commanding position, Mamayev Kurgan became one of the most intensely fought over pieces of ground in the history of the war, as German and Soviet positions constantly changed. Because of its height and symbolism, the small hill that remained of Mamayev Kurgan became the center of the memorial construction, which took place between 1959-1967. From the main entrance near the Volga embankment, the memorial ascends through a path that leads past monumental friezes and statues. Approaching the top, visitors enters the Hall of Martial Glory, with its eternal flame and the walls with names of tens of thousands who fought. 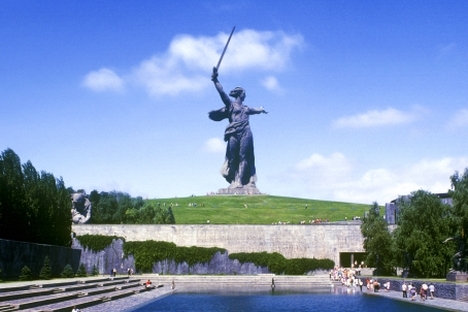 The crowning element is the statue “The Motherland Calls,” a female figure with a sword raised in her right hand and the left arm extending in a gesture summoning to battle. Designed by Yevgeny Vuchetich, it is one of the largest free-standing monuments in the world – 278 feet from the bottom of the figure to the tip of the raised sword. The statue rests on a pedestal 49 feet high. The east side of Mamayev Kurgan is also the site of burial markers, including that of Marshal Vassily Chuikov, whose courageous leadership of the 62nd army under continuous fire will live forever in the history of the battle. From the top of this stunning memorial, a grand vista opens with the broad Volga River and the vast steppe beyond to the east. But at a critical moment in world history, there was no place to retreat. Stalingrad stood, and the fate of the world turned.